The United States Congress designated the Mount Hood Wilderness (map) in 1964 and it now has a total of 64,742 acres. All of this wilderness is located in Oregon and is managed by the Forest Service. Mount Hood, Oregon's highest summit at 11,240 feet, is a dormant volcano covered with 11 active glaciers. This snow covered peak lies at the heart of the Wilderness and is covered with forested slopes and alpine meadows. More than 10,000 climbers a year come seeking the top of the state, making Mount Hood's summit the most visited snowclad peak in America. The "easier" southside climbing route from Timberline Lodge is still a technical climb with crevasses to cross, falling rocks, and often inclement weather. Ropes, crampons and other technical gear is necessary. Climbing season is generally from April to mid-June due to melting snow and rockfall hazards later in the season. Fatalities on the mountain average at least one a year. Other routes on the mountain are much more difficult. Dormant but not dead, Mount Hood still vents sulfurous steam near the summit. Much of the area's annual precipitation of 150 inches falls as snow between October and April. A forest of Douglas fir covers much of the lower elevations, supported by an understory of Oregon grape, salal, rhododendron, and huckleberries (they ripen deliciously in August). More than a dozen waterfalls brighten river valleys that lie in the shade of the deep forest. Listen for the chirps and whistles of pikas and marmots on the rocky slopes at the tree line. 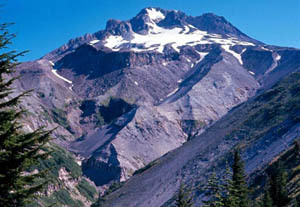 The majestic and very popular Pacific Crest Trail and Timberline Trail encircles the mountain for 38 miles with a large trail washout at Elliot Glacier that requires a large detour. The loop trails cross panoramic alpine meadows painted with summer wildflowers and through the many glacial creeks and rivers that flow from the mountain flanks. Crossing the unbridged glacial creeks and rivers during snowmelt in early to mid-summer, or when heavy or sustained rains fall, can be dangerous. Hikers should use caution and have a backup plan if rivers are too high to cross. At least 21 trails zig and zag their way through the Wilderness to join the Timberline Trail. Most visitors are day hikers who visit on the weekends. Hikers visiting mid-week or camping overnight generally see few other visitors. Planning to Visit the Mount Hood Wilderness? How to follow the seven standard Leave No Trace principles differs in different parts of the country (desert vs. Rocky Mountains). Click on any of the principles listed below to learn more about how they apply in the Mount Hood Wilderness.